My search for an excellent budget 4k Android TV ended when I inadvertently, unboxed a 4k Android TV sent to me for review by an Indian TV manufacturing company that manufacturers Daiwa TV too. 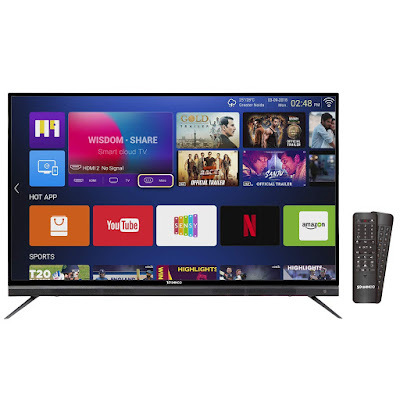 The TV sent to me was their 49 inches 4k Android TV, Shinco, which comes with an innovative Quantum Luminit Technology & whose picture performance is comparable to the upper range TVs of higher brands, like Samsung MU6470. I and my staff were really amazed to see a budget category TV performing this brilliantly. The picture quality of this TV is unbelievingly far superior to all TVs in its category. This 49 inches TV comes with a built-in sound bar and is available in 43 & 55 inches size too. It is just that the 43-inch TV does not come with a built-in soundbar. In the carton along with the TV, you get a two-piece tabletop stand, a manual guide, warranty card, wall mount, an air remote, a pair of batteries & one Sensy STB controller that is a very useful accessory, about which I will tell you, later, in this article. This TV comes with a sleek & stylish design. Its bezel is ultra-slim from three sides. A sound-bar has been fused into the lower side bezel. 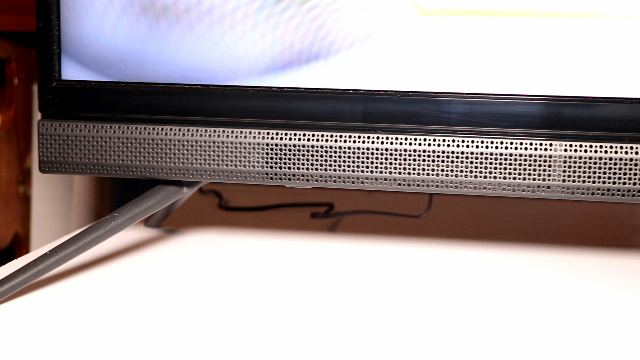 The grill design of this soundbar enhances the overall look of this TV to impart it a tall boy appearance. The built quality of this TV is pretty good, it does not appear a budget TV from any angle. You get 3 HDMI ports & 2 USB ports in it, out of which 1 is USB 3.0. Two HDMI ports have version 2.0, while one is there with version 2.2. It has an Ethernet port, an optical digital port, headphone jack, antenna port, SD card slot, along with inbuilt Wi-Fi. Now, let's switch on this TV. This TV greets us with a Shinco logo. And, in comparison to other Android TVs, this one boots up fast. This TV has built-in HDR-X with 4k enhancer. Dedicated on/off buttons for them have been provided in the settings. Apart from this TV, 4k enhancer is found only in Sony & Samsung TVs. The colours of this TV are \as deep as any QLED TV and the brightness, contrast, picture sharpness all is pretty good. The colour encoding system of this TV rests at NTSC 95%. The VA panel plays a major role in making the blacks much deeper. Against a dark background, you can see colours pop out on this TV. There are 5 picture modes, Standard, Dynamic, Vivid, Soft, User & Eyesafe mode. Eyesafe mode reduces strain on eyes. The viewing angles of this TV are decent considering that it has VA panel. For sound, this TV is graced with a fused-in soundbar that has 2 speakers giving 20 Watts power output. It has Dolby Digital & Surround Sound. Its speakers have tweeters too. The audio is very loud with deep bass deep & there is a clarity in dialogue delivery. On this TV, you get the playability of almost all favourite applications that Indians watch. Applications like Hotstar, Amazon Prime, SonyLiv, Netflix, ALTBalaji & YouTube come preloaded. You can even sideload applications on it. Jio TV & Jio Cinema was successfully sideloaded on it. You will find a lot many games and applications in their Playstore too. The UI of this TV is pretty good that gives a smooth experience while navigating. It has content bar and it starts to give you suggestions according to the programmes that you watch regularly. While browsing contents too, you can watch TV in a small window. The most attractive feature of this TV is the set-top box controller that you get along with this TV. You need to plug this controller in the USB port of your TV and keep the sensor in front of your set top box. After that you will be able to access the channels of your set-top box through the remote of this TV. The channels automatically get integrated into the UI of this TV and allow you an access to the thumbnail preview of each channel. You can easily see the programme being telecast on each channel. Sellers prefer PayTM Mall as over there, there is no pressure on them to maintain quality, nor, they have any fear of getting banned in case there are multiple complaints against them. The company has 105 service centres across India. They also have a Research & Development laboratory in China, where their team researches on manufacturing best quality TVs in a budget. Their main unit is located in Greater Noida. Mam hd channels or full hd movies ki quality vu 43s6575 me ashi ha ja es tv and es tv ki power consumption kitni ha ??????????????????????????????????? does the HDR10 translate to a 10-bit color panel? or the panel is 8-bit and the just supports HDR10 videos? Does this have HDMI ARC? Is this TV brand available in 65 inch segment? Please provide the address or contact number of service centers in Kerala. Trusted service decides the future of the company.